Lucy's Cards: Happy World Card Making Day! sadly, i'm at starbucks studying for next week's test.. but making every excuse for a study break, to see what everyone is up to! hugs right back to you, lucy! happy WCMD! Ahhh!!! Too cute...I love your cards, you are give me gret inspirations with your creations. Thank you and Happy WCMD. Happy W.C.M.D. Love this little monster. So cute. 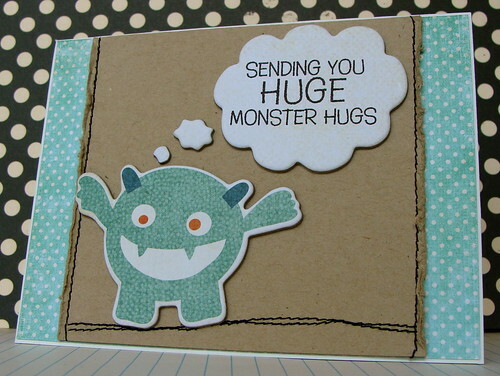 Huge monster hugs back atcha and Happy WCMD! Adorable card. Happy WCMD to you too. Only made 3 cards so far today but it's not bedtime yet. Happy WCMD 2010 to you too, Lucy! I think your monster cards are a monster hit! Happy WCMD Lucy, love, love, love your monster card. This is adorable, I think I need some of those chipboard shapes! Such a sweet little guy!! Cute card! so cute! love the stitched horizon! love this card and the colour combo!